Yum yum. More using up of vegetables. Organic boxes always seem to contain hundreds of carrots, especially at this time of year. Truth is, neither of us are that fussed about them and I generally prefer them raw to cooked. 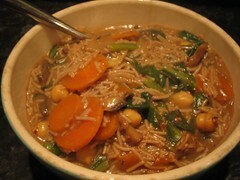 Still, I’d been looking at this soup in Veganomicon for a while and I even had half a tin of chickpeas to use up. Fate was telling me to make this soup! As you can see, my version was very stewlike. Neither of us complained but if you want it more soup like simply add a bit more stock. This will definitely become a midweek regular in our house – quick, easy, healthy, and as long as you have a jar of miso around, it uses storecupboard ingredients too. And one of the nicest ways to use carrots I’ve found! This entry was posted in Veganomicon by efcliz. Bookmark the permalink.